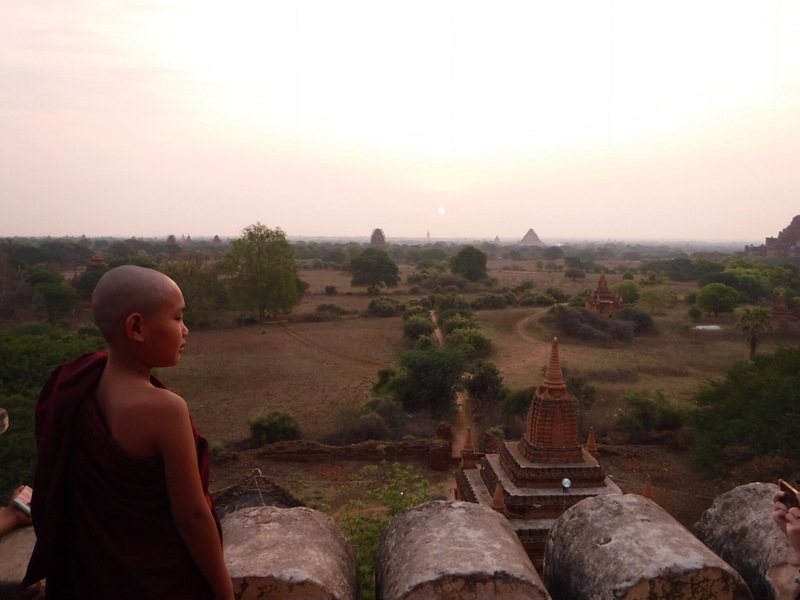 We’ve climbed the Temples of Angkor in Cambodia and we’ve been dazzled by the Grand Palace in Thailand but, to me, nothing compares to the temples in Bagan. The bus here felt long but wasn’t too bad. Getting on and off I also had someone carry my big rucksack for me for the first time in 3.5 months (Ammun has a rucksack that also has wheels so every taxi driver and hostel worker is happy to help her – little do they know that hers is heavier than mine)! It was carried all the way to our twin room and I knew we were going to be treated well here. 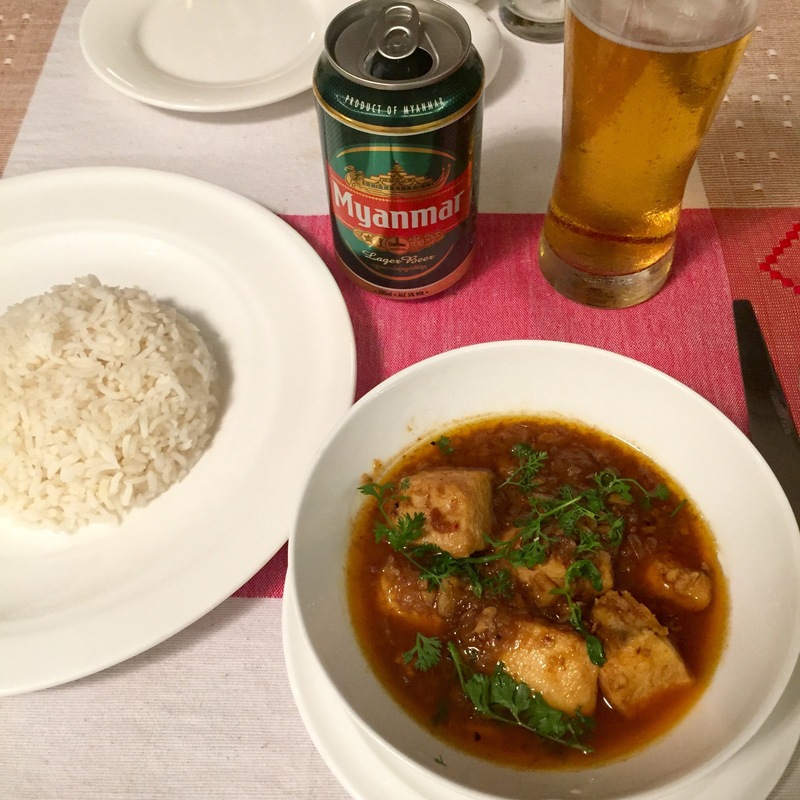 Dinner was only served until 9.30 so we had to go quickly and I enjoyed a Myanmar beer and a Myanmar curry before checking out the pool and going to bed. We, as usual, made it just in time for a nice, big breakfast and then had another nap before the next shuttle bus into Nuang U which is the nearest town. We found a place for lunch and I started to feel a bit ill so I just ordered plain rice and vegetable spring rolls. In the time that it had taken to come I had made two attempts to nap on the table, one attempt at being sick and one attempt at putting my feet up like when you pass out. Nothing was making me feel better but there was no obvious reason why I was feeling so awful. Ammun had sympathy but also saw the humour in it and took photos of me lying on the floor with my feet on a chair. The poor waiters didn’t really know what to saw and let me know that if there’s anything they can do to help, they will. 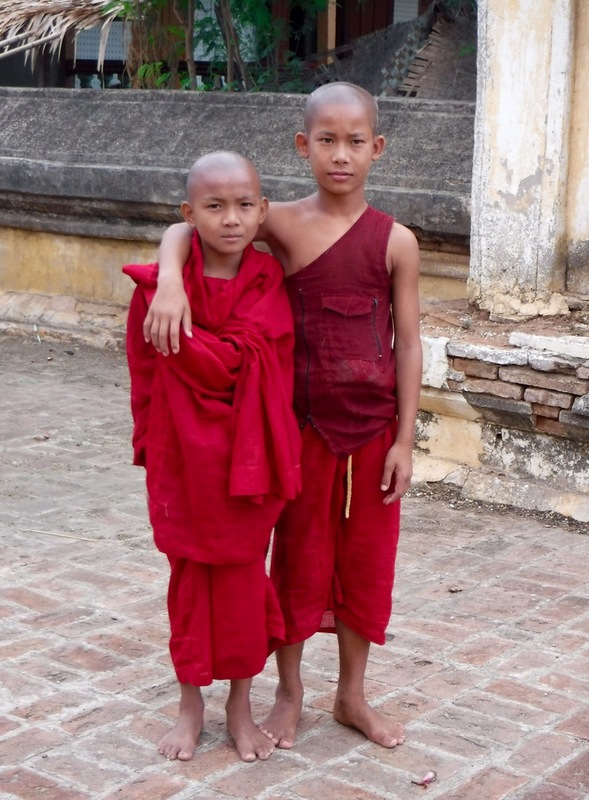 I still believe the Burmese people are the loveliest nation. We walked along the road and found a place to hire bicycles. Everyone in Bagan seems to hire what’s known as E bikes (basically just a scooter as foreigners aren’t allowed to hire motorbikes) so not many places offered bicycles. After our not-so-successful attempt at hiring scooters in Pai and me not feeling well we decided that me driving us around on an E bike was a recipe for disaster. The lady only had two bikes but one was too high for both of us so she got another one which turned out to have a broken brake and it was all so slow. 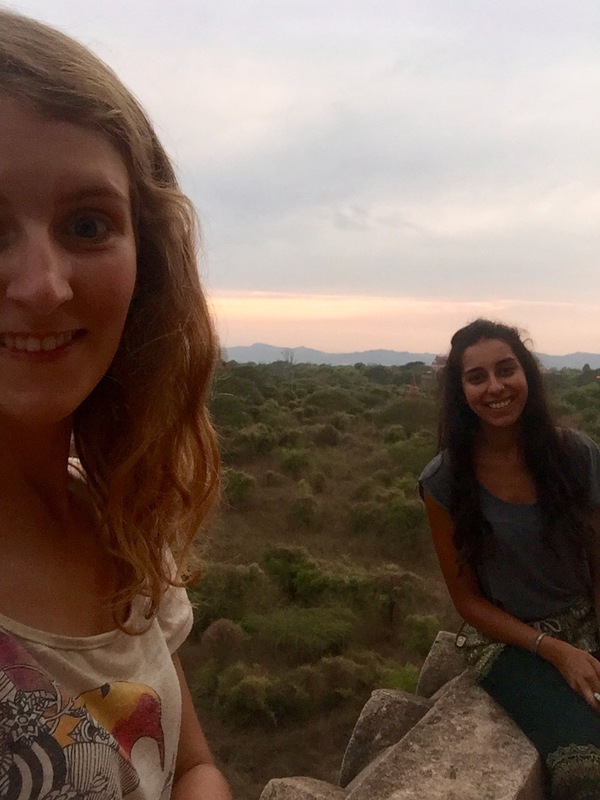 Whilst waiting for her to sort herself out we realised that we were 5 miles from any temples which was pretty far to cycle there and back again. The time was getting close to when the shuttle bus went back to the hotel and the next one wouldn’t be until 7pm so we squeezed into that one and reevaluated our plan. 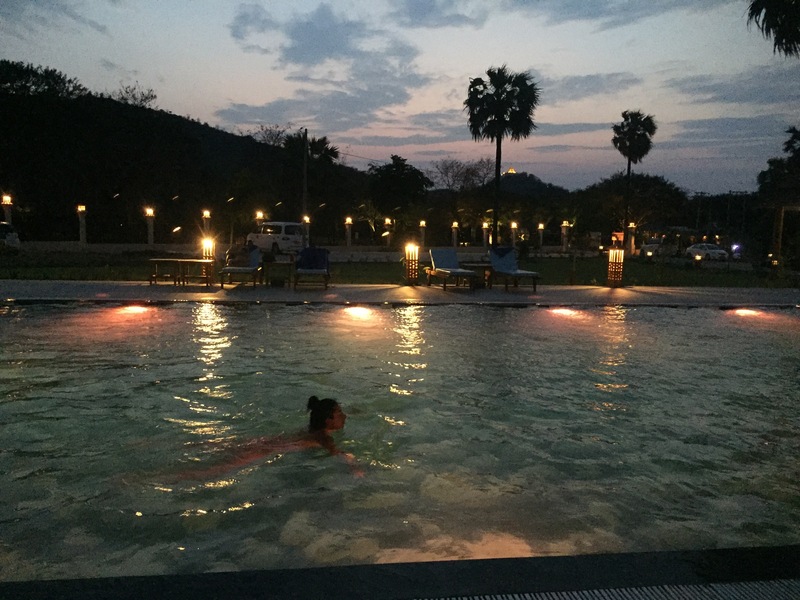 As we had treated ourselves to a hotel instead of a hostel for two nights (I say treated, it was cheaper than the cheapest hostel in Bagan) we made use of all the facilities. We went to the gym for about 45 minutes where I finally got to have a really good stretch and then swam in the cold pool for 30 minutes which I think is the longest I’ve ever swam for! 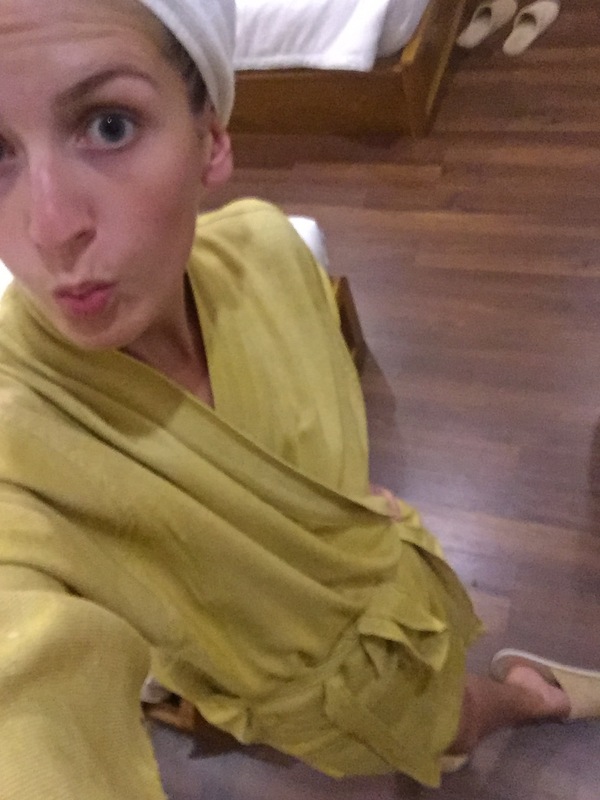 We went back and got showered, moisturised and made ourselves feel fabulous. We had dinner in the hotel again and I had pork and black bean sauce with chips and we shared a salad. It was all very nice but the portions are way too small for us. 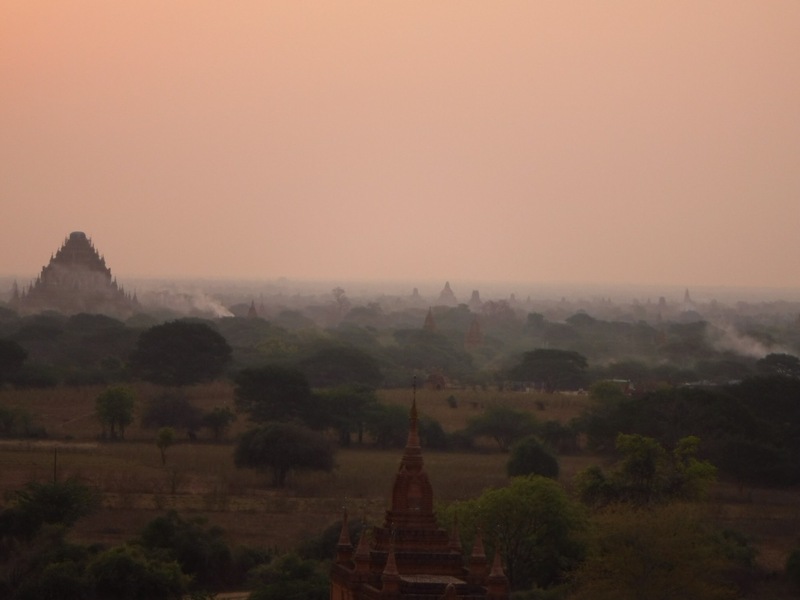 The next morning we were up well before dawn for the main thing that Bagan is famous for: sunrise over the temples. Usually this view is accompanied by a flurry of hot air balloons but we were heartbroken to hear that balloon season ended just one week before we arrived! My bank was happy though as even the cheaper packages are more than US$300! 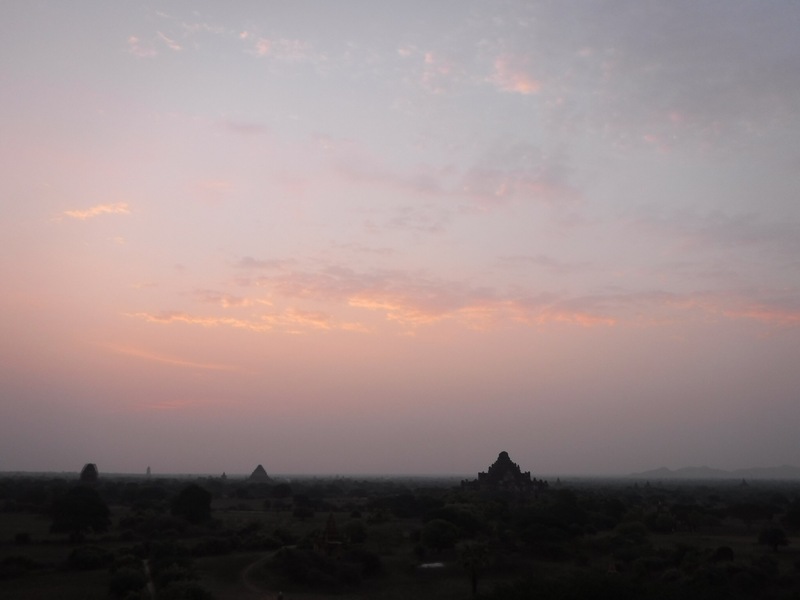 It wasn’t the best sunrise I’ve ever seen but it was still an amazing sight from the Shwezigon Temple. 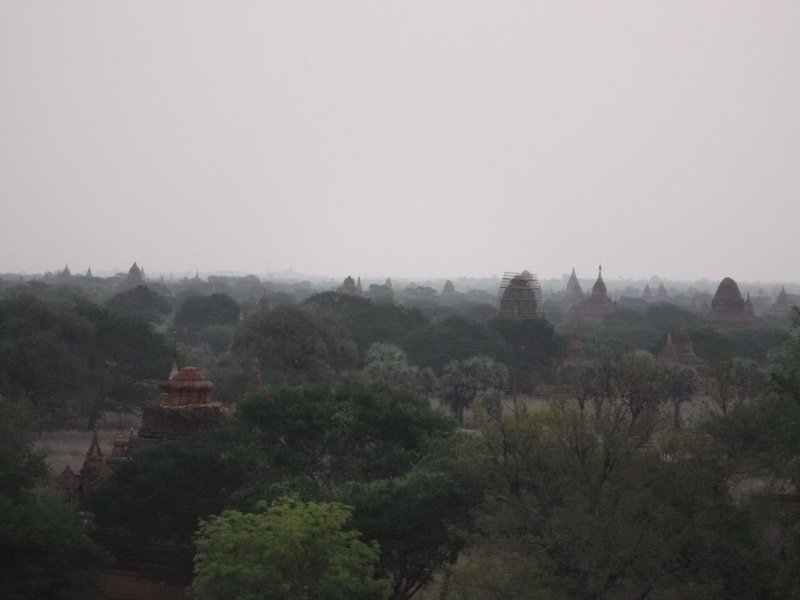 It wasn’t crowded at all, unlike the Temples of Angkor and everyone was very quiet as the watched the tops of temples appear over the fog covered trees across the horizon. 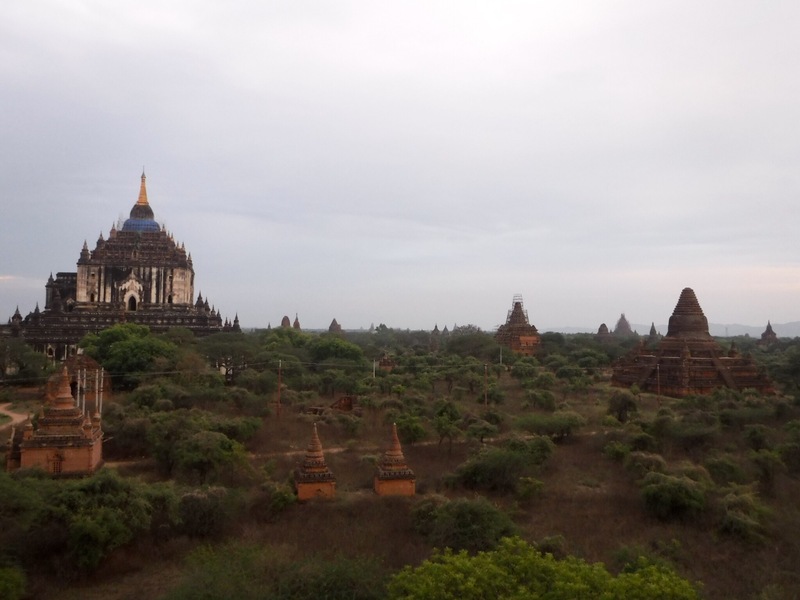 Ammun managed to count 85 temples from one position. Our taxi driver then too us to a nearby town called Myinkaba where we were told that we could hire bicycles. They were wrong. There was not a bike or E bike in sight. Tired and frustrated, we went back to the hotel and got some much more informative staff tell us how and where to hire bicycles. After a nap, breakfast and another nap (why are we constantly tired?!) 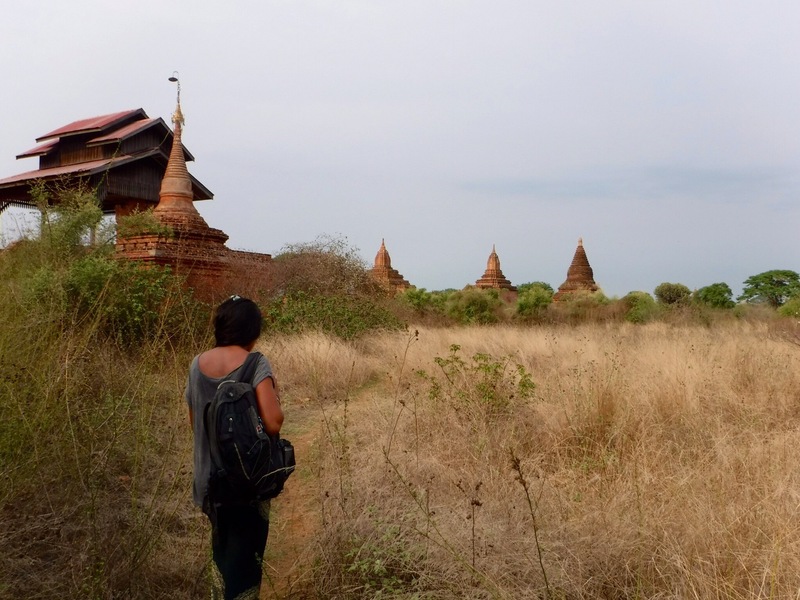 we got the 1pm shuttle that took us into Old Bagan. We had the same driver as before and the poor guy drove us around for ages until we found a woman who had a lot of bikes but because it was absolutely chucking it down with rain, she said we shouldn’t hire them. Our taxi driver left us in front of a vegetarian restaurant that was apparently rated number 1 on TripAdvisor (but I can’t seem to find it). The food was amazing and it came with a few sides, which is how food seems to always be served in Myanmar, Burmese tea and a dessert! The family that owned the restaurant seemed so happy to serve us as we were the only people there and they had an extra magic touch when they febreezed the toilet just before we used it, every time. It’s the little things right? Despite everything online saying that you needed an E bike and that walking wasn’t an option, we decided to rebel from the advice and walk. 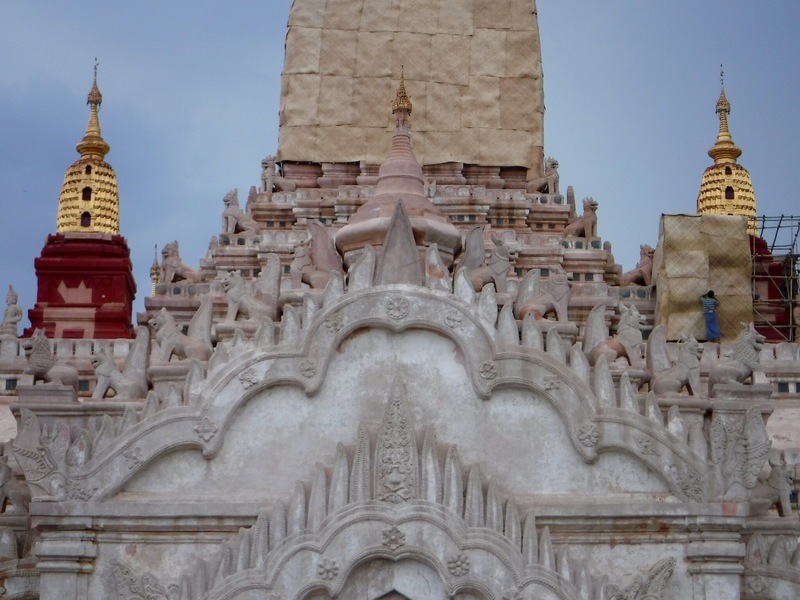 There were quite a few temples around of varying sizes and we had a great time! 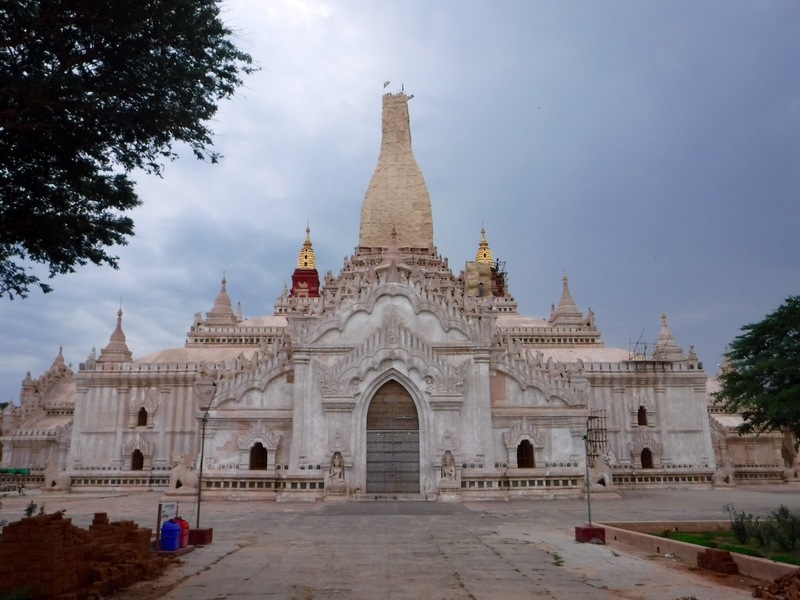 Between the 11th and 13th centuries, more than 10,000 temples were built in Bagan. Nowadays just over 4,000 remain. 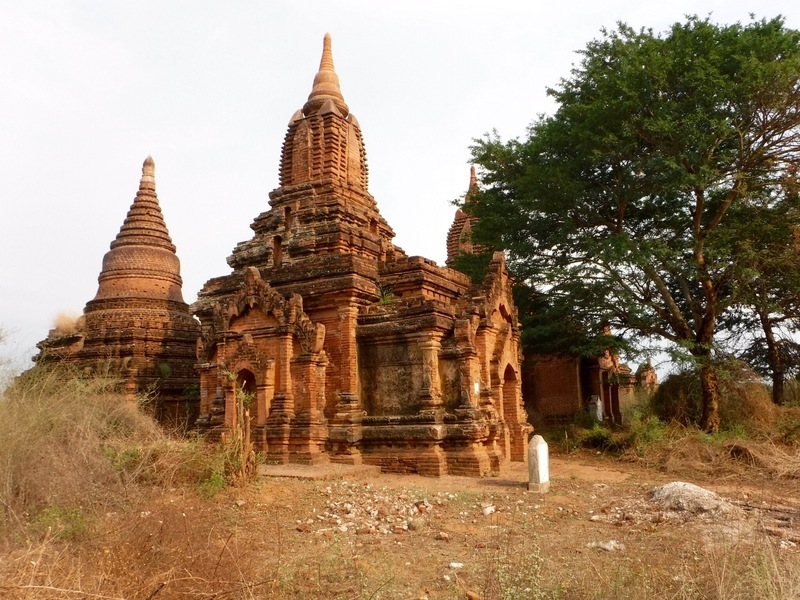 Shwezigon Temple was the first to be built around 1044 when the king of the time brought Theravada Buddhism to the country. 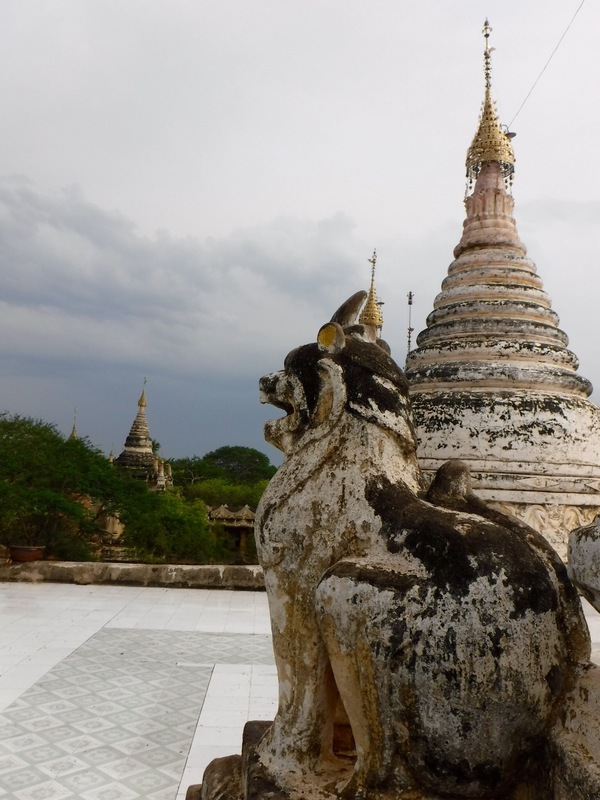 Over the next two hundred years, Kings continued to build temples of all sizes, even if it meant bankrupting the country! 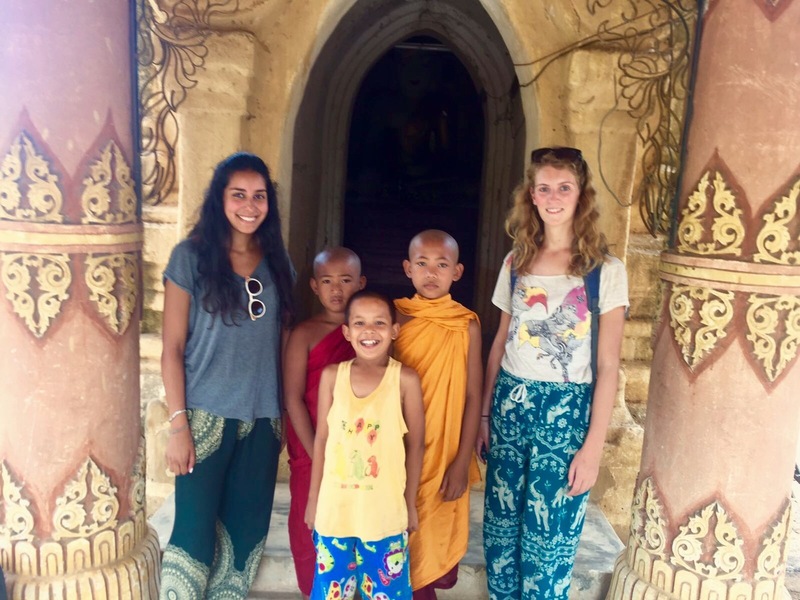 Then a medium sized one where four brothers (two of which were monks) aged 9, 10, 12 and 16 invited us into their temple next to their house and took pictures with us. They were very happy to show us and the younger ones found it hilarious pushing the 16 year old closer to us, making him blush. I didn’t have the heart to tell him that he’s a bit too young for us. 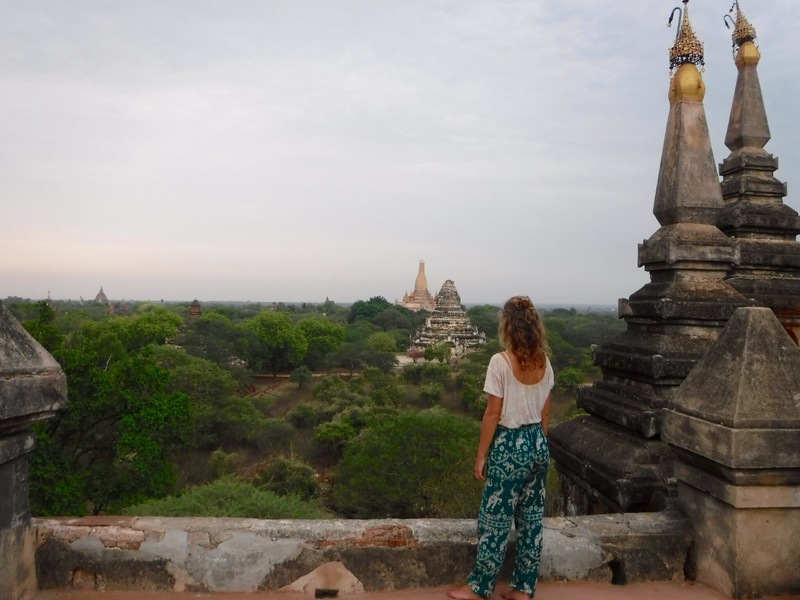 The internet also told us that despite there being 4,000+ temples, you’ll never be alone in one. As we were on foot, we fought our way through bushes and over fields to find some smaller ones and these were the less well maintained ones. There was animal poo inside and even a few cigarette butts but it was cool to be venturing out completely alone. 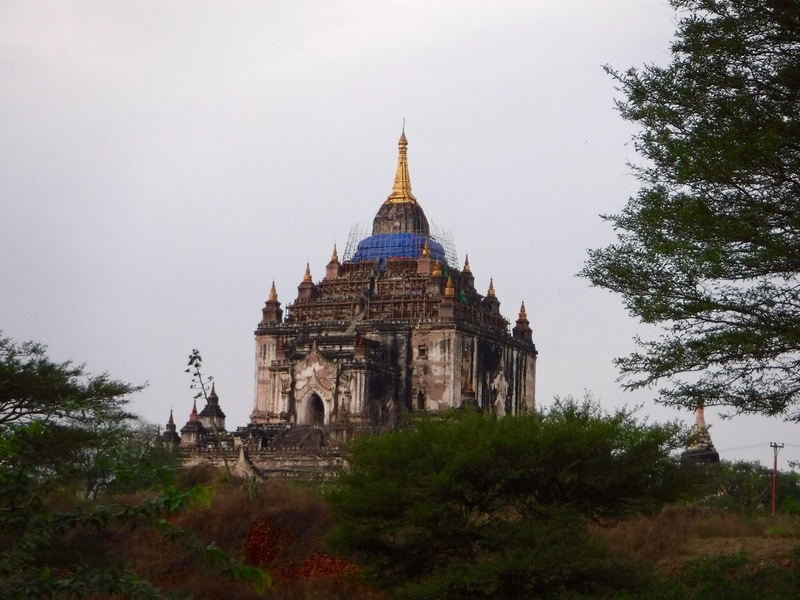 As well as small temples we also saw some of the even bigger ones. These ones are Ananda Phato and Thatbyinnyu which is the tallest. You have to pay US$20 to visit the big ones but we didn’t pay. As sunset came we saw a few more big ones and watched the average sunset from the top of one of them that had no name in English. 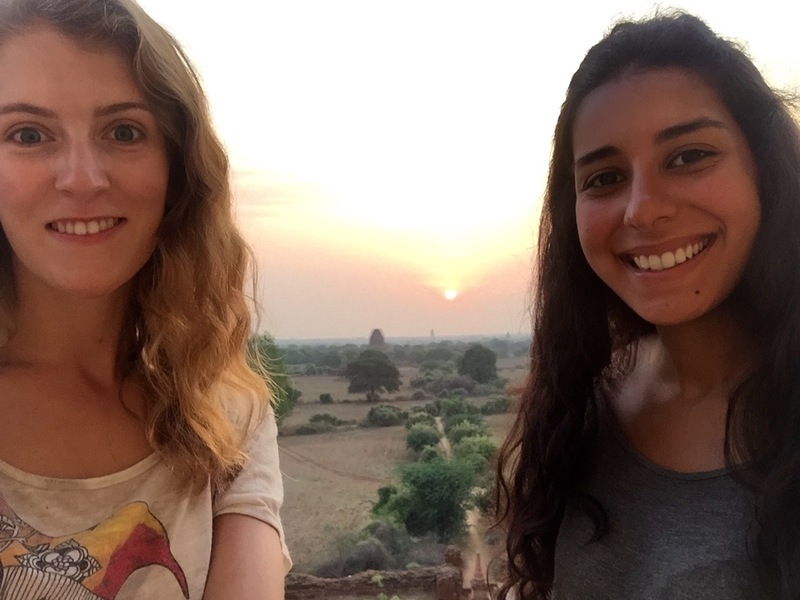 We walked back into Old Bagan for dinner at another vegetarian restaurant which are very common in Myanmar and we cheekily asked them to call the hotel for the free shuttle bus. 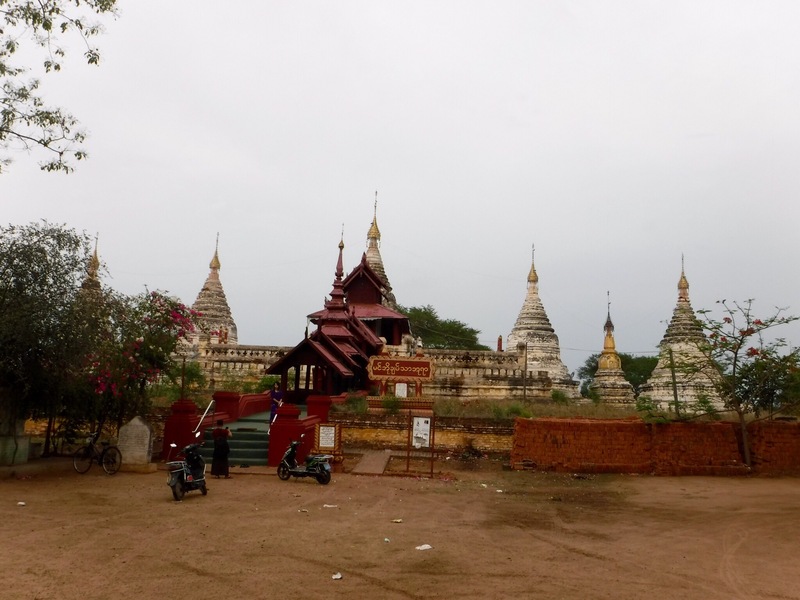 Once we were back we had a short amount of time to quickly get our stuff together before yet another night bus to Inle Lake. I guess it depends how much you love temples… We were satisfied with just one afternoon but I can imagine some people spending 2-3 days there! It would probably be best to rent bikes or E bikes to see all the big ones but then also do some on foot to see the smaller ones where you’ll be the only people there. I’d also recommend going in ballooning season either to fly in one or just watch them! Such an amazing sight. 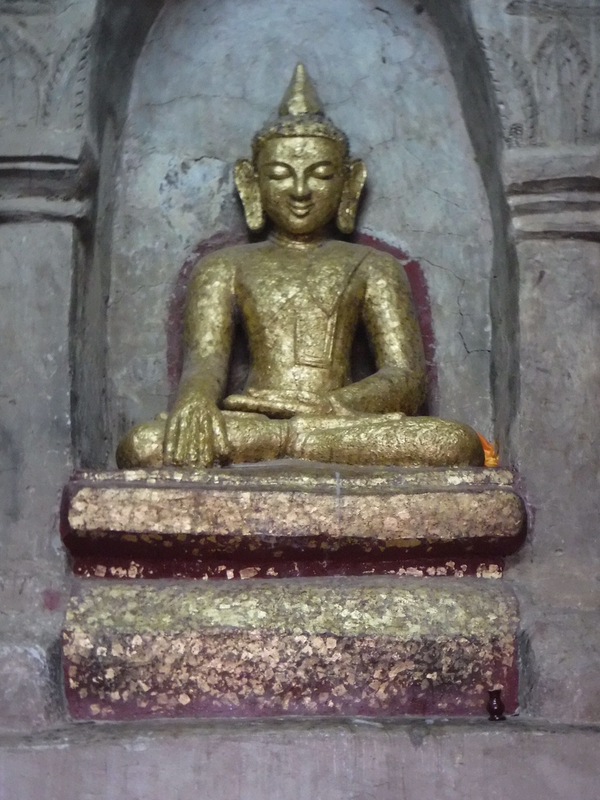 Can’t wait to visit here and see those temples with my own eyes! 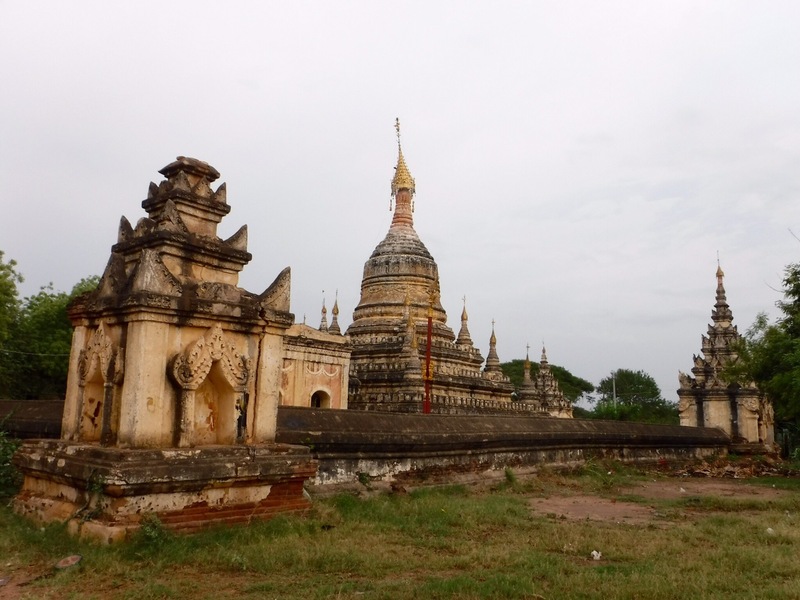 Myanmar – it’s such an amazing place to visit with all these beautiful temples. 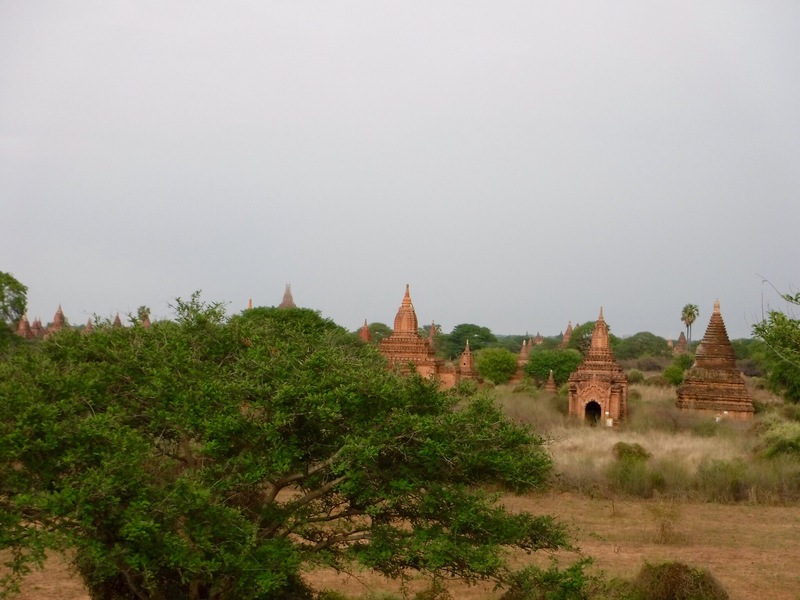 Bagan is looking like a place from an other world.